We initially touched base on Tactical Concealment Manufacturing offering the Advanced Camouflage Concealment System on their high quality Sniper Apparel last week. It turns out the guys at A-TACS Camo have been working on some great product shots out in the field and in the studio. We have provided their full overview below complete with imagery and full specs for the different products. Since 1999, Tempe, Arizona based Tactical Concealment Manufacturing has been the "go-to" source for all manner of specialized sniper gear and other concealment products. The Mamba Suit in A-TACS Camo - The Mamba offers the operator full body concealment. The Mamba Suit is combat proven and the "King of Choice". It is built from scratch and constructed from the highest quality materials and highest performance fabrics available. Ultra lightweight and strong as nails, the Mamba is provided ungarnished allowing the operator to garnish it as best suited for their operating environment. Superior design and quality workmanship attribute to its popularity with military special operation teams. - Closed-Chest System, Side entry via Fastex buckles along side of Blouse. - 550 Nylon Cord for Garnish Attachment (Tighter grid work for more effective foliage attach). 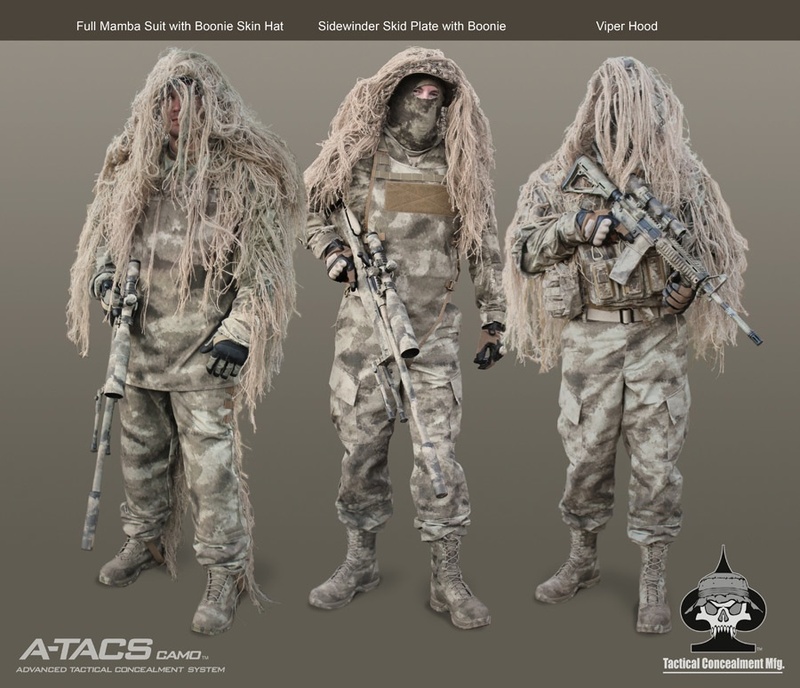 - Blouse is upgradeable to accommodate Tactical Concealment's Adjustable Sniper Hood. - One-Size-Fits-All Sleeve Length via Wrist Tension Cords. - MOLLE Webbing integrated on each trouser leg to accomodate your own custom gear-pocket. - Entire back of shirt is ventilated with a Flame Retardant Mesh fabric. The Cobra system base garment is designed to be worn in conjunction and work in unison with combat loadout equipment including LBV’s, Assault Vests and slim line backpack systems. 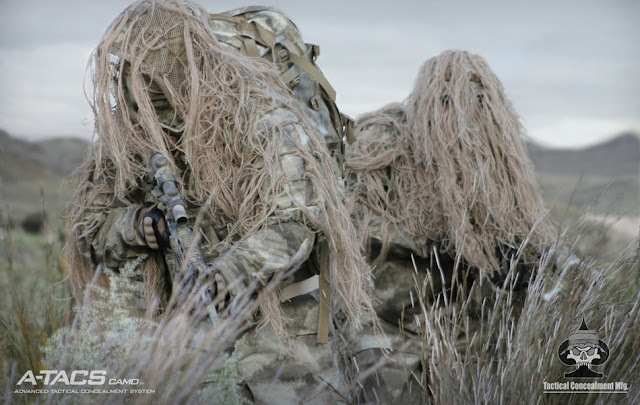 The operator can now achieve the camouflage/concealmenteffectiveness a sniper has in a ghillie suit but scaled into a package that is practically suited toward the working needs and style of an assaulter. The Cobra is suited for LP/OP, Reconnaissance/Intelligence Gathering, Ranging, Forward Observation, Dismounted Patrol, Ambush Line and Target Beaconing. One size fits most. - One-Size-Fits-All, Adjustable chest tension straps, hood cinching cords. - Nylon Cord is bar-tacked throughout entire outer shell to accommodate the use of jute or foliage. - Fabric and Nylon Ventilation Mesh construction equals weightlessness and durability making the system comfortable and non-restrictive. The GhillieSkins Viper Hood is a new high-speed low-profile and lightweight garment designed not just for snipers but for any operator who can benefit from having an edge toward visual based camouflage/concealment. Specific to this type of operator is that like the Cobra, this garment is also designed to be worn in conjunction and work in unison with combat loadout equipment including LBV’s, Assault Vests and Backpack systems. The Viper Hood is also well suited for LP/OP, Reconnaissance/Intelligence Gathering, Ranging, Forward Observation, Dismounted Patrol, Ambush Line and Target Beaconing. One size fits most. - Easily stuff into BDU pant cargo pocket when not in use. Designed to provide an operator a smooth unobstructed chest skid surface to conduct effective sniper low crawls. Additionally it provides much needed comfort and reduces physiological degradation often found against harsh ground surfaces and temperate conditions. The one piece skid plate is constructed from 1000 denier Cordura nylon. Adjustable straps transverse the wearers waist and back allow for adjustment for different size operators. Quick employment and exit of the garment are performed behalf 1-inch ITW Nexus buckles. An inner liner hosts a side entry pocket for document and map storage and allows the operator to adjust the level of chest padding. A 1-inch webbing egress crotch strap keeps the SideWinder from riding-up during reverse crawls. Combine the SideWinder Chest Skid plate with Tactical Concealment’s Viper or Cobra upper garments along with the Armadillo leg chaps and you will have a completely modular sniper garment suited for a wide variety of tactical applications. The Snipers Boonie is designed to address the critical factor of head and shoulder concealment, One size fits most. - Outer portion of brim has 550 cord tacked in place for foilage or jute attachment. - Oversized netting allows user trim netting to their preference.